I was 4 yrs old when The Empire Strikes Back first hit the silver screen. At that time, my family lived in a small first floor apartment in a rather poor area of Queens, New York. As such, I tended to play outdoors only when my mother was available to supervise, otherwise I was left to my own devices indoors. I was an "only child" at that time. You could say, I was a "lonely child". Bad pun? Yes, but accurate. There were other children on the block where I lived, but not in the same building. I usually watched these children play ball in the street, or ride bikes, all from my bedroom window. I wanted very much to join, but they were all older children. So I just sat there and watched. It was around the time Kenner started airing commercials for the Empire Strikes Back toys when it happened. A boy moved into an apartment upstairs. He wasn't much older than me, and like me he wasn't allowed to play outside unsupervised. I'd see him on the stairs or playing in the hallway. At some point my mother and his must have spoken and they would allow us to play together in the hallway... as long as we didn't go outside. Sounds good doesn't it? It wasn't. That kid was a jerk. 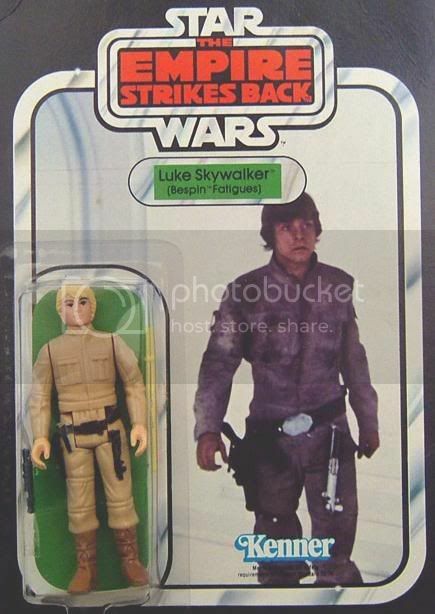 One day he came over with a brand new Luke Skywalker in Bespin Fatigues action figure! He showed me his lightsaber and gun, but I could only see it. I wasn't allowed to touch it. I was a girl, and well, aside from having cooties, girls lose accessories it seems. To convince him otherwise, he said, I'd have to bring out MY Star Wars action figures so we could play. Problem was, I didn't have any Star Wars figures. Heck, I wasn't sure WHAT Star Wars was, other than what I had seen in the toy commercials. (I was convinced Han Solo was captured by an upside drinking glass for years!) And don't let it be forgotten that Star Wars were "boy toys", and I was NOT a boy. So I went inside my home and came back with something that might pass for an action figure, a Playmobil knockoff. To say I was laughed at would be a disservice to the howling histerics I was subjected to. So went back inside, sat at my window, and watched the kids outside play ball and ride their bikes once more.